Somehow I’ve seen there are two types of people who crave for Ramzan food. The first type who flocks out to Chitpur and gorge on the street Haleem, bakarkhani and what not….. and the second variety (and much much larger a number), who craves for the ramzan haleem (among other items) but does not venture out with on streets due to hygienic reasons. 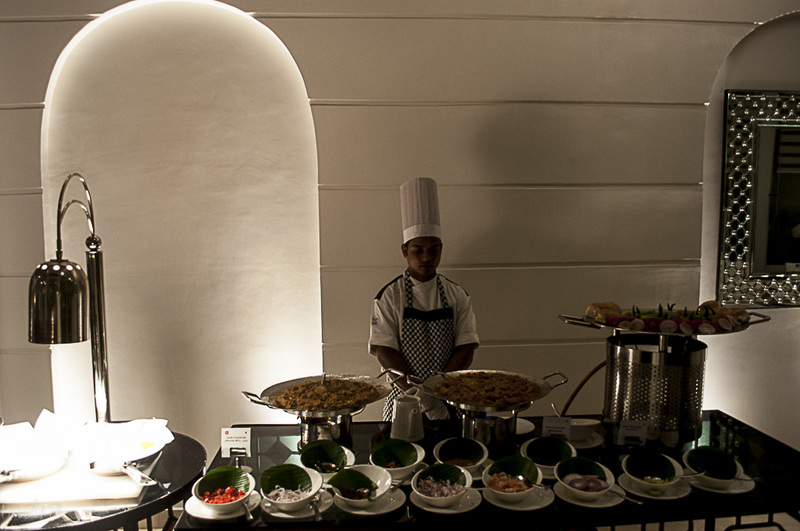 But this post is solely dedicated for the second variety – an iftar party in one of Kolkata’s finest hotels, The Lalit Great Eastern- in its Alfresco outlet. 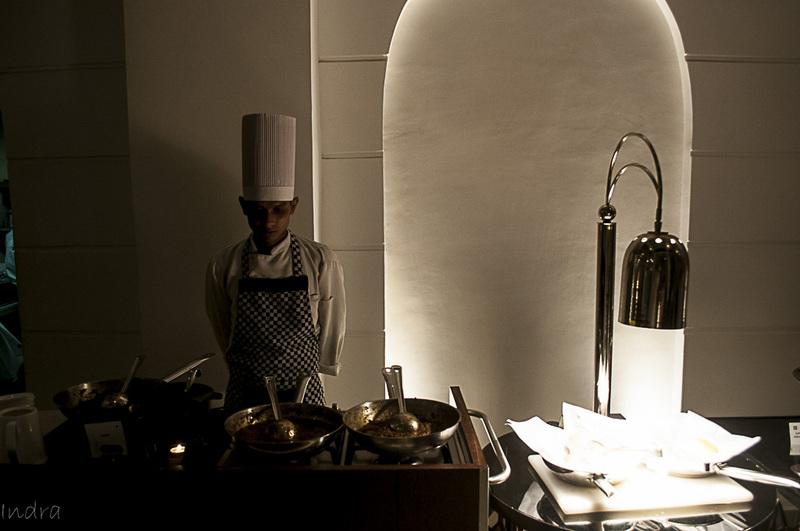 We were invited to the Al resco, the beautiful ground-floor outlet at The Lalit Great Eastern for their iftar menu launch. Starting now, it’ll be held every friday 6 PM onwards for June and July. 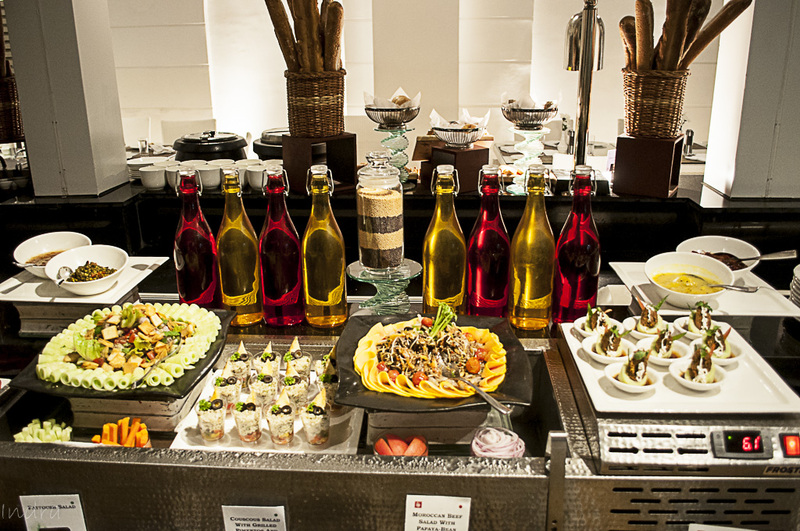 Moderately priced at 1550/- per head for a gala spread, its definitely worth a try. Behold and we’ll gorge in the details shortly. There’s no use describing the ambience of a 5 star hotel. Its basically almost the same everywhere. Posh, suave, subtle- waiters are well-mannered and ready to help. The moment we entered, we saw a nice sit-out with some interesting live counters. As we settled down, we were served on table the usual deep-fried items (which are used to break the fast) which consisted of Dal bara, Egg-devil, mini mutton chop, piyazi and cumin-flavored aloo-chop. Being a religiously non-veg bong, I skipped most of them, but the ones which were tasted, were great. We went for the soup counter and happily discovered my favorite one, Yakhni mutton shorba. This is one particularl mild, subtle version of mutton soup cooked with the juice from mutton shanks- here it also had mini mutton moti (small mutton balls) dipped in it. “The evening is going to be well” I said to myself. For the live counters, the first one was having Mutton-Ghugni and pau-bhaji and the adjacent counter was having 2 types of haleem- Mutton and veg. “Veg-haleem ? Never heard of them…” And I freaked out (how wrong was I). 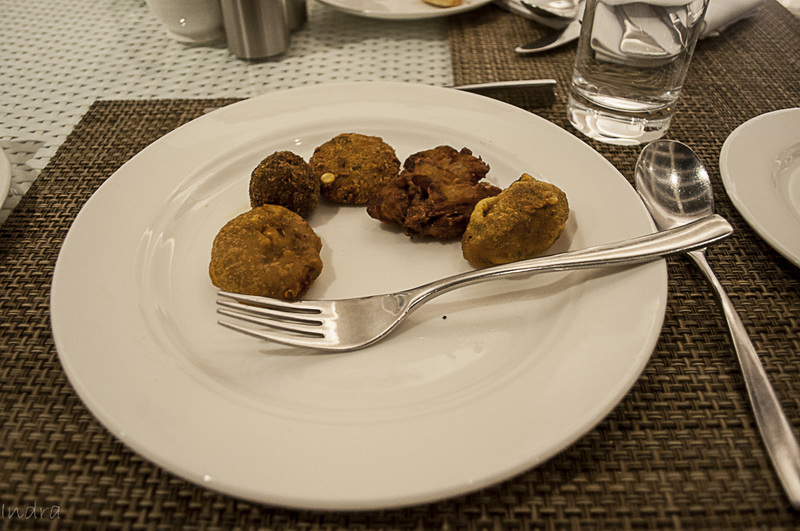 We got our portions of each of the items (just I personally skipped the bhaji part and only opted for the pau). It was being heated and was sprinkled with chopped coriander, fried onion, lemon wedges and fried nuts and lots of ghee. The haleem is great (a little sticky) and the meat paste was brilliantly cooked with different dals, wheat and barley. Many a sad souls, who’re deprived of haleem during this period due to hygienic reason, rush for this. Its brilliant. A little spicy than the usual stuff that we’re used to, I loved it. 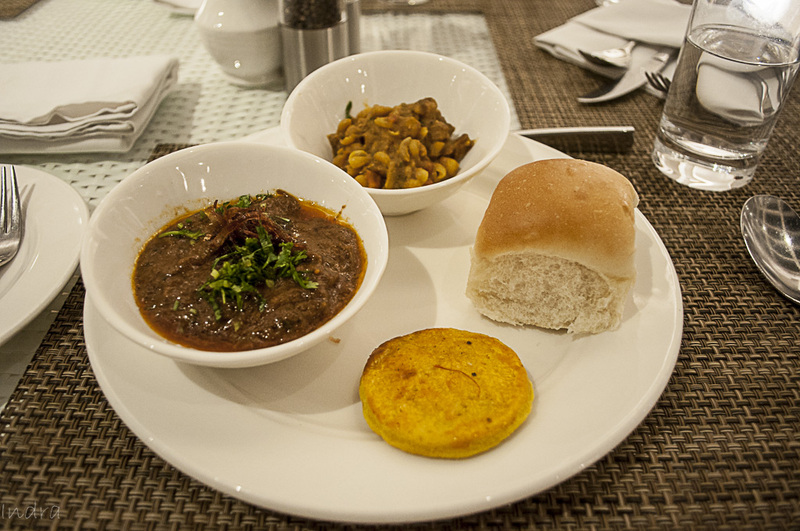 But the revelation was Ghugni with solid mutton chunks. 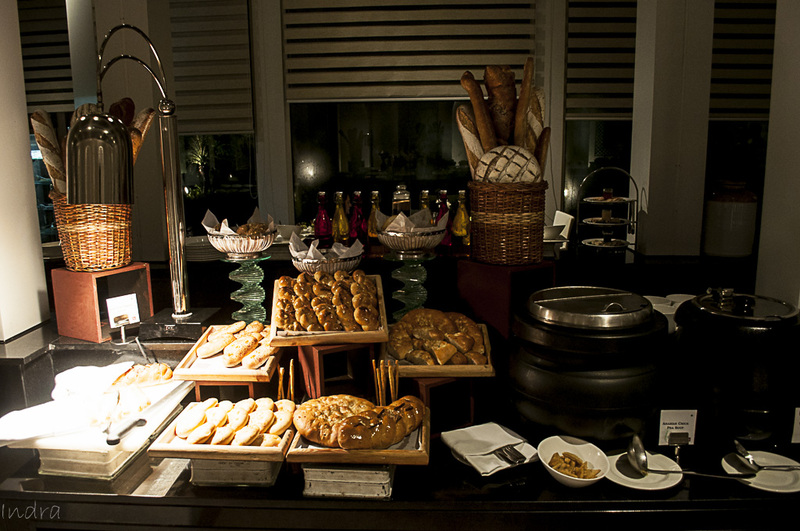 Paired with Pau, its pure heaven…. Next was Keema-pau. 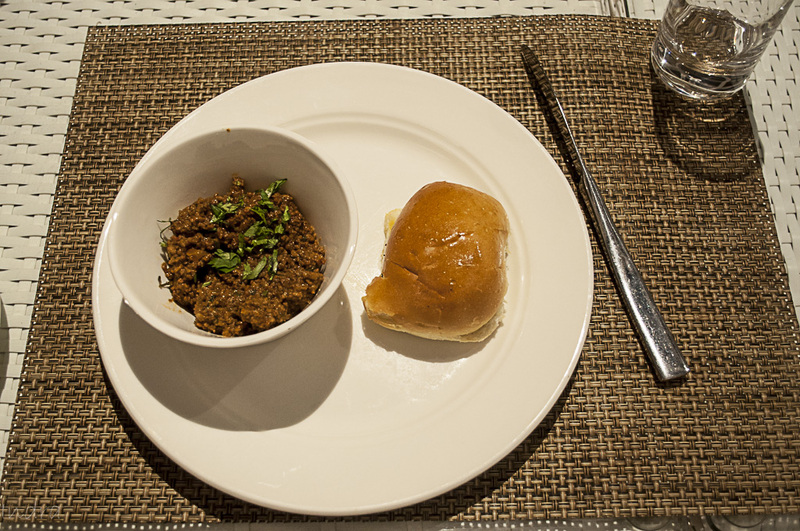 A slightly less-flavored dry mutton-keema paired with butter-fried pau- liked it. After the good-start, we went for the main course. Now, let me clarify one thing. 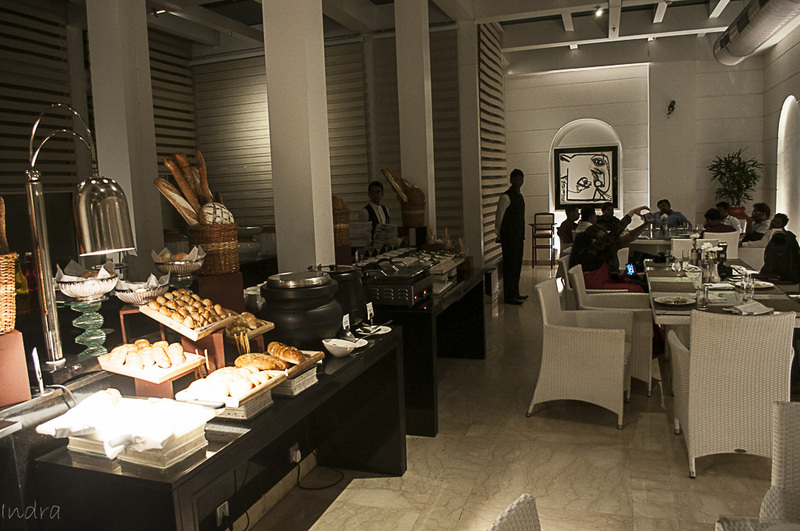 There was a nicely laid spread of many a things, but I concentrated only on the non-veg items and desserts. Hence, won’t be able to comment much on other items. Even having so many items for one person, is an extremely difficult task. 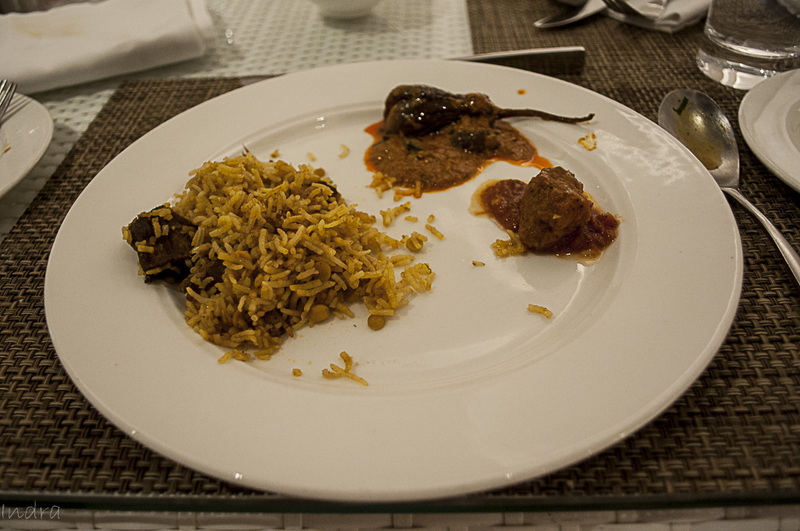 Frankly, I was expecting a biryani in the main course- any sort. But, here it was different. They made a khichda with chunks of mutton and I can’t say how happy I was. This made my day and happily just the next item was Baghara baigan. Now, for the lesser-known mortals, baghara baigan is one heavily spicy til and tamarind flavored dish with whole baby-brinjals. Both made a great pair. The third item was mutton balls cooked in herb-flavored tomato gravy- personally which I didn’t like. 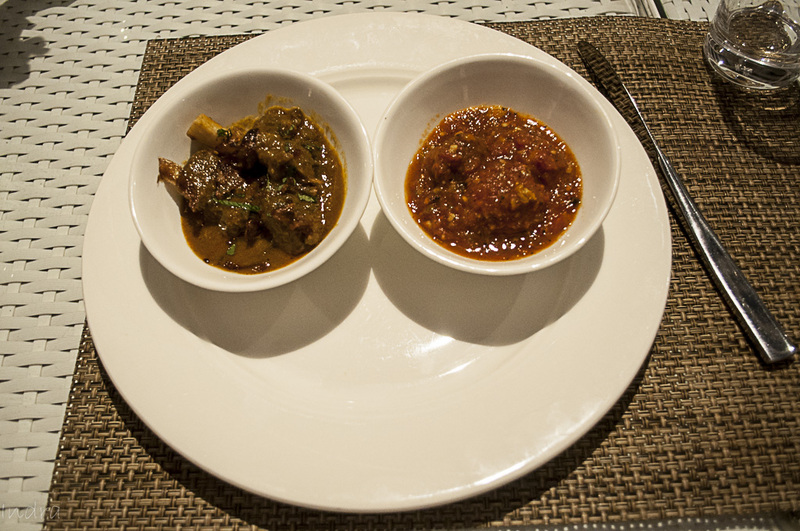 The set of items consisted of mutton nihari and dry-fruit-stuffed paneer roll cooked in saffron gravy. This thing I could not understand. As per my knowledge, nihari was a breakfast dish and not a dinner item. 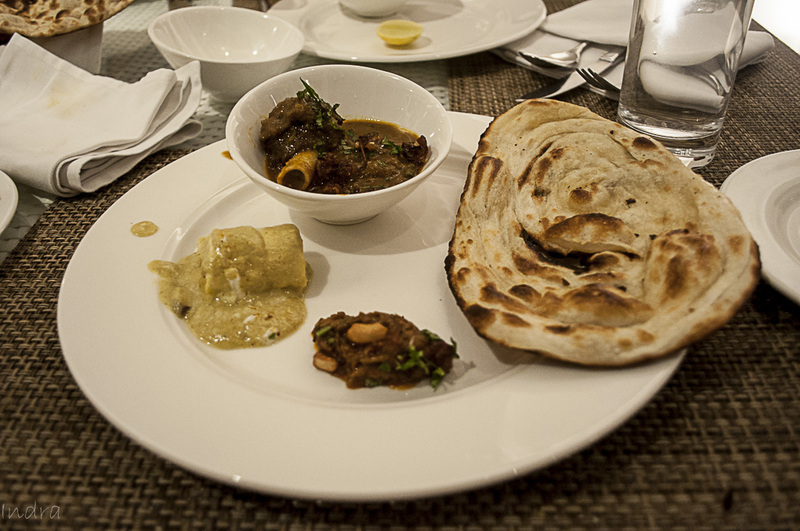 But, a good mutton dish is welcome any time of the day and we gladly went for it. The nihari is slightly thick in texture (unlike the variety we normally see during winter breakfast). It was extremely tasty when paired with some naan. The paneer item was surprisingly subtle. Finely chopped dry-nut stuffed paneer roll was cooked in saffron flavored mild gravy, which gave our palette a welcoming rest from the spicy meat dishes. 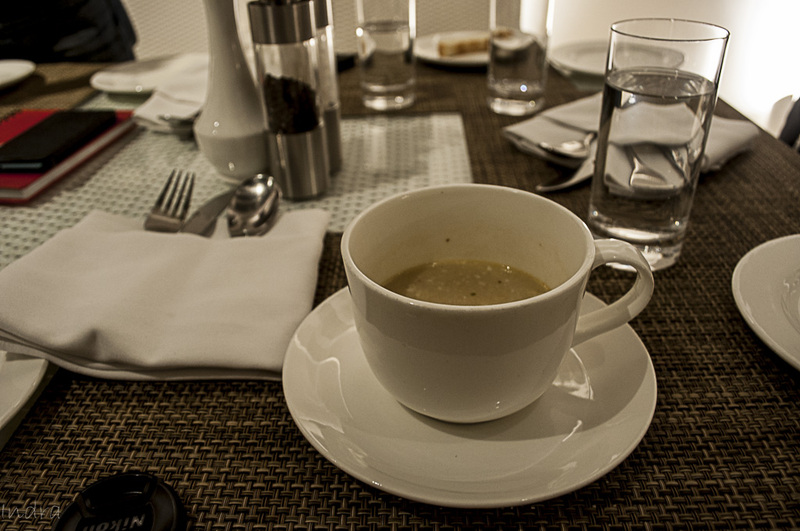 We were full but on the chef’s special recommendation, we had veg-haleem coocked with soyabean keema. It was brilliant to say the least. A must-try and a definite recommendation. 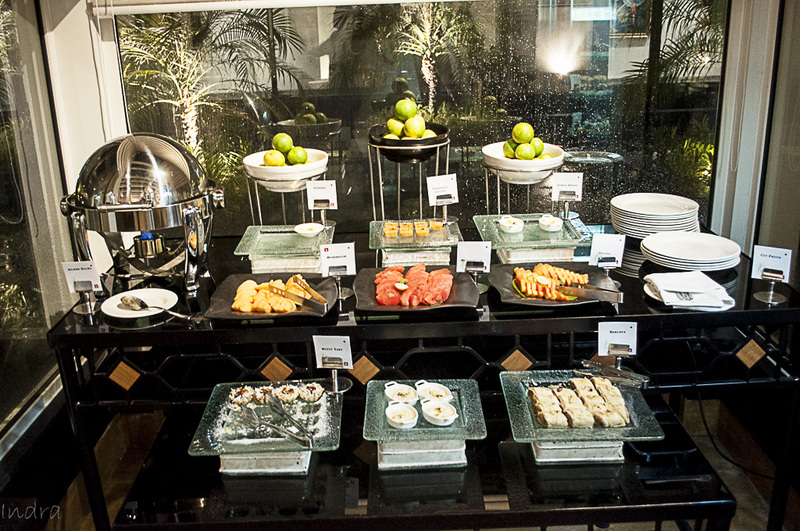 Now, was time for the dessert counter. This spread was the best thing that happened to us in the whole evening. 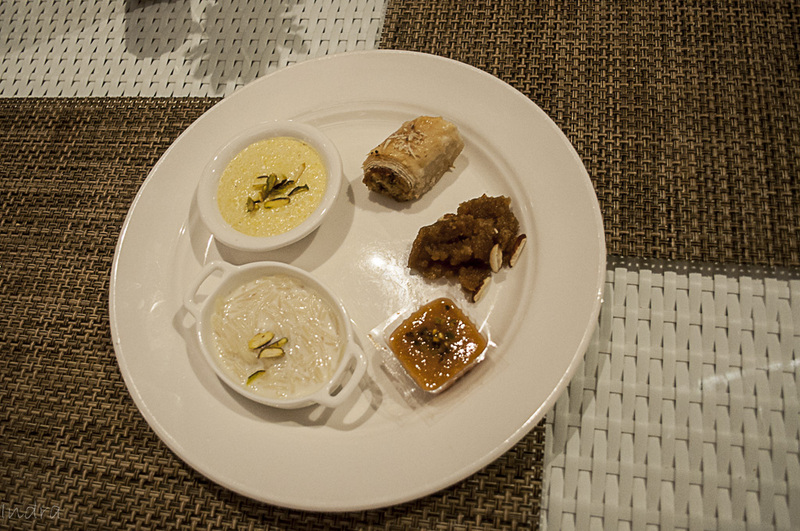 All the regular items were present like the anjeer ki halwa, khubani kameetha, semiya, phirnee and THE baklava. “Baklava in Kolkata ?” I jumped on it. And it definitely did not disappoint me. The baklava they made here is of roll-shaped, stuffed with dry fruits as usual and was good. The anjeer-ki halwa was heavy and royally smeared with ghee, wherein the khubani ka meetha was slightly tangy in nature- enjoyable. We were full- and that too to the heart’s content. And its time to take the mandatory group photo and bid a good-bye. On our way out, we discovered there was a live jalebi with milk stall, but we could not make it, so opted out. 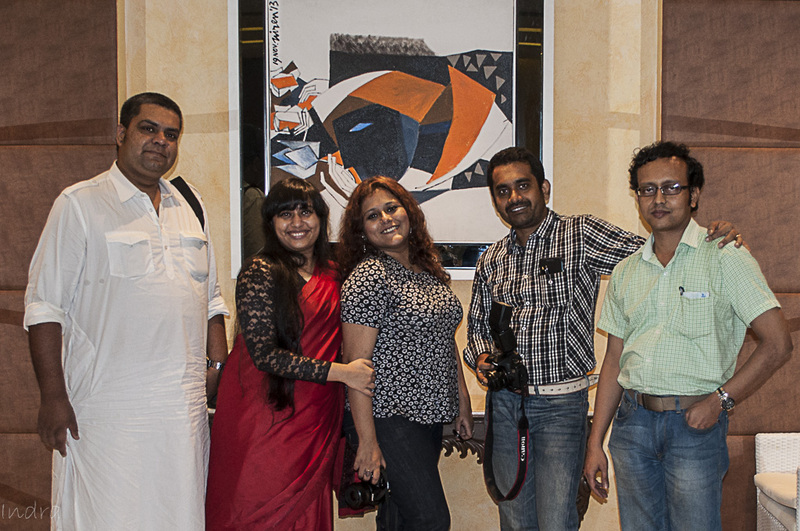 A great evening- thanks Lalit Great Easern Hotel- will definitely come again. 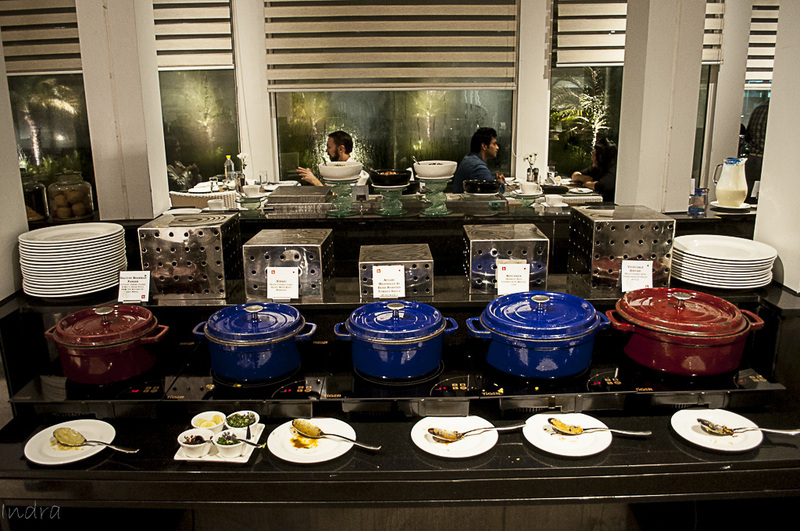 At 1550/- per head, this buffet is a must-have for all the unlucky souls, who’re deprived of the taste of haleem, nihari, meat khichra and other typical muslim food items due to road-side-shop’s hygiene factor till now. But only bad part, they operate this menu only on fridays in June and July. So, go for it. Ghugni with meat chunks, veg haleem, mutton haleem, nihari (not the usual variety though), anjeer ka halwa, khubani ka meetha and baklava…..